I’ve known John for quite some time and have been lucky enough to enjoy his cooking on a number of occasions. He’s a talented guy and seeing him enter the world of catering has been fun. Let’s learn more about this character and if you’re in need of any catering needs, J. Carson Catering may just be your thing. Matt: When did you get into cooking? John: I have been cooking for as long as I remember. My Mother was a good cook and she basically showed me how to follow a recipe. I really started cooking for myself and others right after graduating from college. My second date with my wife, Kendall was a dinner for 2 featuring chicken Marsala, homemade fettuccine Alfredo, and a Ceasar salad. With all that garlic, its a wonder we had a third date! Matt: How did you learn? Did you have any “mentors”? John: Again, I learned the basics from my mother. I also worked in restaurants during college as a waiter and did a lot of observing of food prep and cooking. No mentors that I can think of. Matt: Are you a cookbook fan or food show fan (or both)? If so, what are some of your favorites? John: I have a closet full of cookbooks, from all different types of cooks. Julia Child, Anthony Bourdain, Gary Wiviot, Chris Bianca, Thomas Keller. My collection runs the gamut. I do watch a lot of food shows and really enjoy Diners Drive Ins and Dives. I have tried a number of recipes that were featured on the show. I watch BBQ shows, Mind of a Chef, etc. I try to stay away from the reality shows. Matt: At what point did you want to take your love of cooking and turn it into a profession? John: I have been cooking for “side money” for about 10 years. Until last year I had a full time job that prevented me from doing much outside of a few weekend events. Now that I am not tied down to an office job, I am free to do many more events. 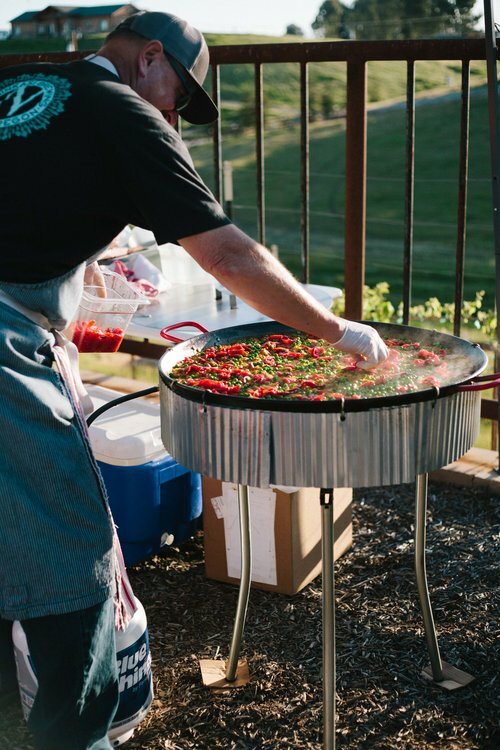 Once I realized that people really loved my Paella, I decided to concentrate on that. Matt: Do you go by recipes created by others or do you come up with your own? John: I am a recipe guy. I make up pizzas, but basically follow recipes for other things. I am more of a visual person rather than a creative type. Matt: How would you describe your style of cooking? John: My styles of cooking is “Rustic Homestyle”. I don’t use tweezers nor do I produce any foam! I do a lot of comfort type foods. BBQ, Pizza, and of course, Paella. Matt: What are a few of your favorite dishes to cook? John: I love smoking meats. Pizza is one of my favorite foods to cook. I make my own dough and have a wood burning pizza oven, so we use that often. I also do some private events at wineries and homes that have wood burning ovens. Matt: What kind of events do you cater for? How many people? John: My main focus is on Paella for larger groups. I have done events for 450 over a 4 hour timeframe. I do the major festival weekends at a couple of wineries and have served 700 over a two day weekend numerous times. That’s not to say I don’t cater smaller events. I have one coming up for 8 guests in an air B&B that requested Pizza and Paella.